Paul O’Brien has been involved in the motorcycle industry here in Australia, and overseas for the past 25 years. Paul is now proud to offer you his services at Factory Forty Six, as a motorcycle maintenance trainer or rider trainer. 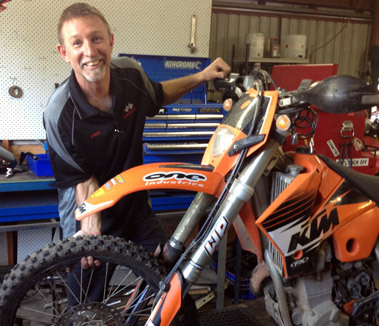 Having run a successful repair business on the Far North Coast of NSW for the past 16 years, Paul has turned his attention to teaching the ‘tricks of the trade’ and helping others to develop their riding skills. Paul is well accredited to assist you. Here has two Certificate III in Automotive Mechanical Technology, (Light Vehicle and also Motorcycle), a Certificate IV in Training and Assessment and a Certificate IV in Transport & Logistics. Paul also has teaching experience from being employed by TAFE NSW as a Teacher and Disability Support Teacher as well as a Technical Assistant TAFE NSW. 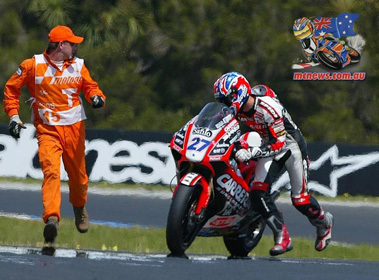 Paul also has a Motorcycling Australia Officials License. Having attended many road racing events, motorcross & enduro events as a mechanic and as an official, here and overseas, Paul now enjoys riding his dirt bike in the bush or at venues, plus hopping on his road bike to attend rally’s, and touring trips to such places as Phillip Island. With Paul establishing Factory Forty Six, much of Paul’s experiences are being putting into training packages to deliver entertaining but informative courses, so that you, the bike rider can maintain you own equipment, and / or get out of trouble when out riding your pride and joy. Factory Forty Six is conducting these maintenance courses and rider training courses throughout Australia. Click on the contact us link, and let us know if you would like Factory Forty Six to come to your area. Factory Forty Six also conducts Quad Bike Maintenance Schools and Quad Bike Rider Training. Paul is passionate about minimizing the accidents that occur on our farms in Australia, and would like to see every Quad Bike operator attend some type of Rider Training Course. As we all know, we need farmers, and we need healthy farmers! Browse thru the links on the Factory Forty Six website, to see where Paul can help you.